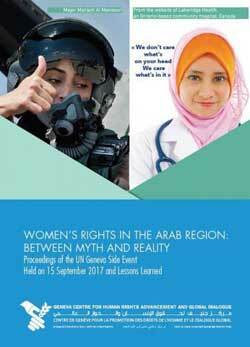 GENEVA, Feb 5 2019 - (Geneva Centre) – A new publication entitled “Women’s Rights in the Arab Region: Between Myth and Reality” has been released by the Geneva Centre for Human Rights Advancement and Global Dialogue. On 15 September 2017, the Geneva Centre organized a meeting on the same theme in cooperation with the Permanent Mission of the Arab Republic of Egypt at the United Nations Office in Geneva. It was held as a side-event to the 36th session of the UN Human Rights Council.